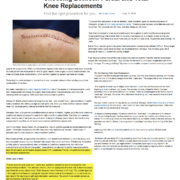 In a previous blog, I discussed that by using VERASENSE sensor-assisted technology (click the link to read the full blog), I see more consistently excellent results after total knee replacement (TKR) and revision TKR surgery. This device, which is shaped like the definitive tibial plastic bearing, has an embedded micro computer chip and pressure sensors that transmit pressure measurements to a monitor in the operating room. It is inserted temporarily into the tibial tray during the procedure. It allows me to precisely match tibial tray rotation to the femoral component, which has a huge bearing on soft-tissue tensions. Without this device, a surgeon must rely on boney landmarks to optimize the relationship or congruency between the tibial and femoral component, which is much less accurate. Pressure measurements, both medially (inside) and laterally (outside) are captured at specific poses during the arch of motion, showing me the amount of pressure being experienced on each side of the knee and where on the tibial tray the pressure is being exerted. This directs super precise soft-tissue release and/or further boney resection to create optimal pressures on both sides. It also allows me to analyze knee kinematics by seeing the location of pressure points on the tibial tray as the knee is being flexed. Based on this information, I can again make small changes to the resected tibial surface or release fibers within the posterior cruciate ligament (PCL) to optimize results. Previously, surgeons had to rely on experience and “feel.” Now we can create the most optimal positioning of the prosthesis and balancing of the soft tissues for each patient’s unique anatomy. Some early data and a 2015 multicenter study demonstrated exciting results. This observational study included 300 TKR patients from eight different centers around the U.S. Participating surgeons performed their standard TKR surgeries. VERASENSE sensor-assisted technology was used after the components were implanted and prior to implantation of the definitive plastic insert. Intercompartmental pressure measurements were collected at precise poses throughout the range of motion. Knee kinematics also were analyzed. 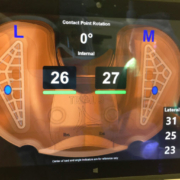 Data demonstrated that when the pressure difference between the medial (inside) compartment and lateral (outside) compartment was less than or equal to 15 pounds, a statically higher percentage of patients felt better and performed better on a number of validated clinical assessments. Based on this data, a knee was considered “balanced” if the difference between medial and lateral compartment pressures was less than or equal to 15 pounds throughout the range of motion. A knee was considered “unbalanced” if the intercompartmental pressure differences were greater than 15 pounds. Knee Society Scores (KSS) for Pain and Function, Activity Levels and WOMAC scores were calculated at six month, 1 year and 2 years post-op. Statically in all groups, the patients with “balanced” knees significantly out-performed patients whose pressure measurements defined them as being outside of the balanced parameters. The scores actually were higher in all areas measured by six months and remained significantly better when retested at later times. In my opinion, how satisfied my patients are and how well they are feeling and doing post-TKR is the most important gauge of how successful an operation was. A literature review examining patient satisfaction scores from 2000 through 2014 reveals the Average Patient Satisfaction score is only 81% (range approx. 73% – 90%). 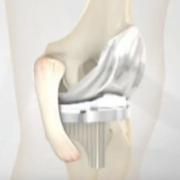 This means that approximately 19% of patients who have had a knee replacement are not satisfied with the result. In this 2015 Multicenter study, our two-year results revealed that “balanced” patients reported being satisfied or very satisfied 97% of the time versus only 81% in the “unbalanced” group. So, the group where intercompartmental pressure differences were greater than 15 pounds (unbalanced) reported being satisfied or very satisfied only at the same rate as the literature comparison from 2000-2014. Many attempts have been made to improve TKR outcomes over the years. 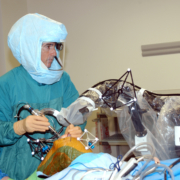 These include computer navigation, patient-specific instrumentation, minimally invasive instruments and techniques and different methods to balance the soft tissues. VERASENSE sensor-assisted technology is the only method that actually has improved patient satisfaction. Time will tell whether it also improves longevity. Please click here to read a recent article I published on this subject. 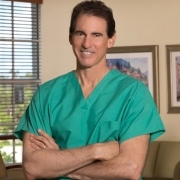 By combining VERASENSE sensor-assisted technology with computer navigation, my surgical ability to predictably and optimally perform TKR is greatly enhanced. I explain to my patients that by having intra-operative quantifiable data which directs more precise component positioning, soft-tissue release and boney resection, I’m much more accurate, which facilitates more predictable results and more satisfied patients. Clinically, I also see much faster recovery times as evidenced by most patients walking the day of their surgery and going home next day. Also, there is less need for extended out-patient physical therapy after discharge. More patients also report to me that their new knees feel normal. As a surgeon who specializes in joint replacement, that’s my goal. It is incredibly gratifying to give my patients back a true quality of life, from simple movement to enjoying the sports and activities that worn joints previously had prevented. For me, having patients tell me their new knees and hips feel like “real” joints is what it’s all about.